I am participating in the A to Z 2012 blog challenge throughout April. 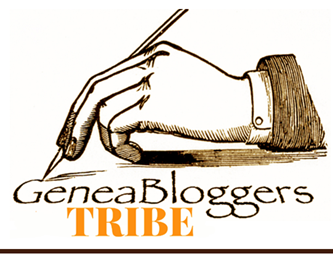 My theme is a genealogical travelogue or a travel genealogue (I’m not sure which). 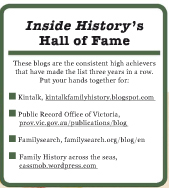 Today is about two towns important to my family history in Australia. 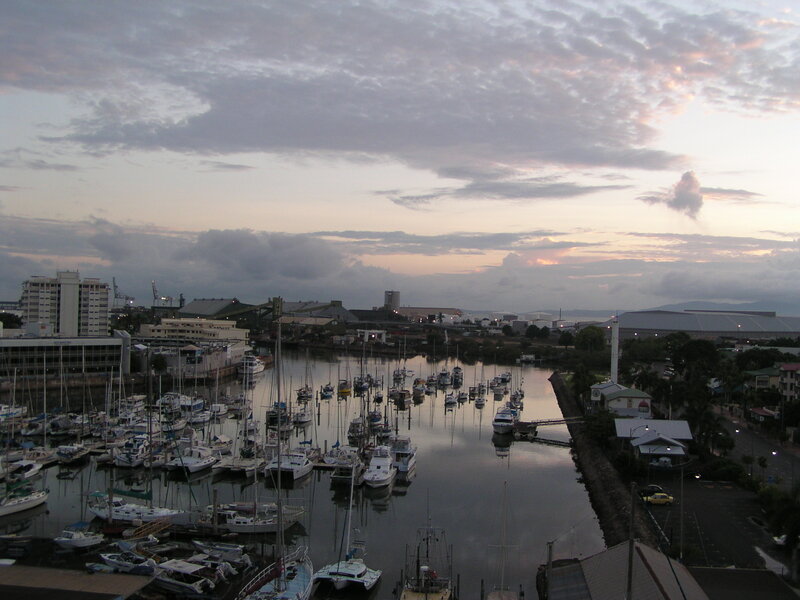 Townsville is the hub for Far North Queensland (FNQ) as well as one of my family’s hubs. It was a critical supply point of men and armaments during World War II and many Australian and American military personnel of the era would have been familiar with the town. Townsville also reminds me of Darwin because it is another place where you men in military uniforms form part of everyday life around town because, like Darwin, it is potentially Australia’s front line of defence. Like Darwin it too was bombed during World War II. 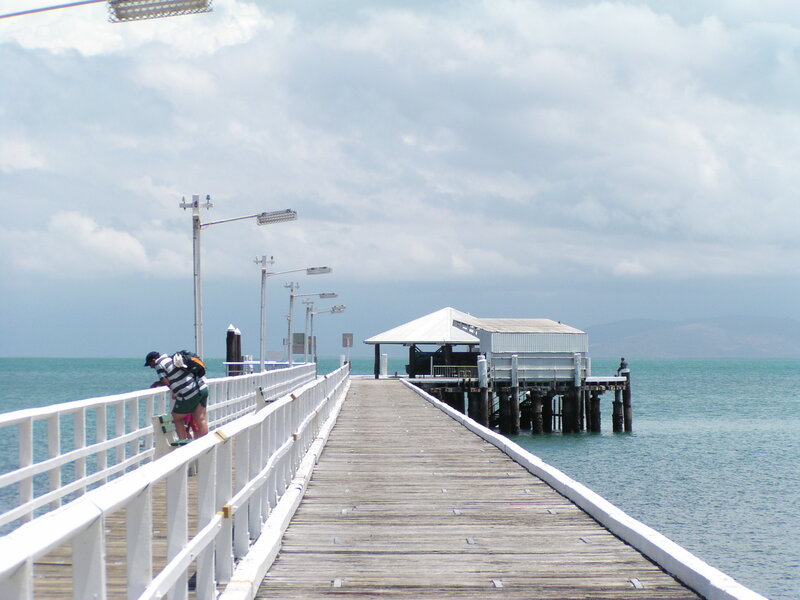 In peacetime it used to be one of Queensland’s quiet country towns, with the esplanade bordering the sea and looking across to Magnetic Island. I’d be surprised if anyone born or bred in Townsville never visited Maggie, as it’s known, for it was the local day-trip and holiday spot. These days Townsville is a bustling modern city, with a major university and medical school, and the esplanade has been revamped for outdoor living and dining out in the restaurants. I was very surprised to see the changes when I visited about 6 years ago. Dominating the city, then and now, is Castle Hill, guardian of the city. My grandfather was living in Townsville in 1913, before he was married, working as a railway carpenter. My family would continue to live in Townsville for nearly 30 years. My grandfather built the house they lived in at Baxter St, West End and he was, as always, heavily involved with St Mary’s Catholic Church West End and the Hibernian society, with which he held many roles. In 1941, he decided to move to Brisbane so that his daughters would have more opportunities to get jobs. I’m sure that was the rationale he gave them, but I’ve always felt the real reasons may have been different. The war in the Pacific was gearing up and he may not have wanted his family to be more at risk in the north, and he also may not have wanted them as exposed to an overflow of military people (he was very strict). It’s not impossible that the railway may have wanted him in the south as well, for by then he was a supervisor and a very experienced carpenter, part of a team churning out railway carriages which were important to war effort. His war years were spent as a supervisor in the Railway workshops at Ipswich. We’ll never know the real reason for the relocation now, as his railway service record reveals nothing but his change of workplace. This move was one of those family history turning points, and quite a recent one. Without the relocation my parents would not have met and I would not have been here. A bit “Sliding Doors”. 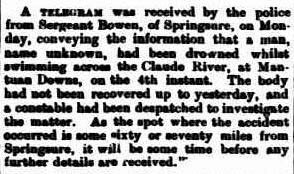 Toowoomba is a locus for the Kunkel family after the dispersal from the Fifteen Mile and Murphys Creek. Today it’s possibly one of two places in Australia where the surname, when stated, may not bring a “huh?” from the listener. 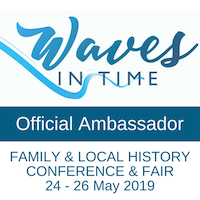 For a long time, it was from Toowoomba that the Kunkel family’s religious support came, and their children and some grandchildren were baptised or married through/in the Toowoomba Catholic churches. 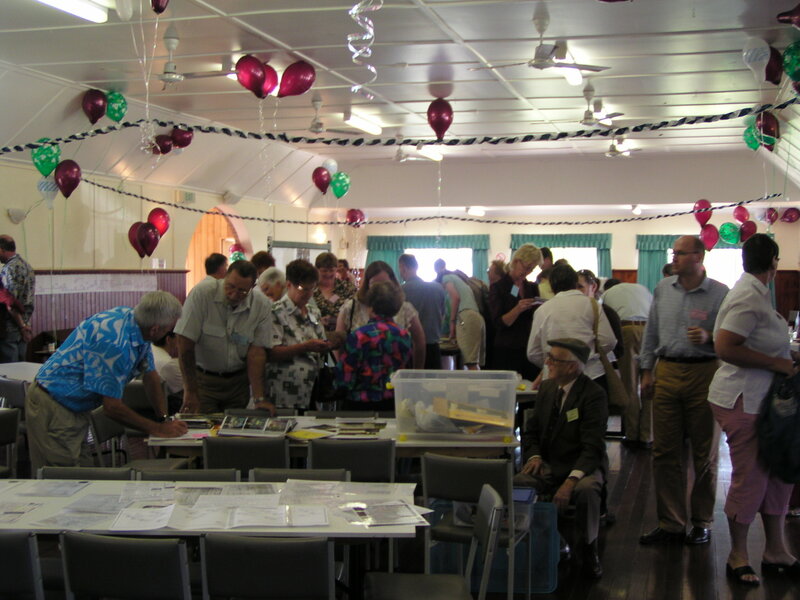 It was in Toowoomba that in 2003 we held the first known reunion of the Kunkel family for close to 100 years and I launched the family history Grassroots Queenslanders, the Kunkel family. 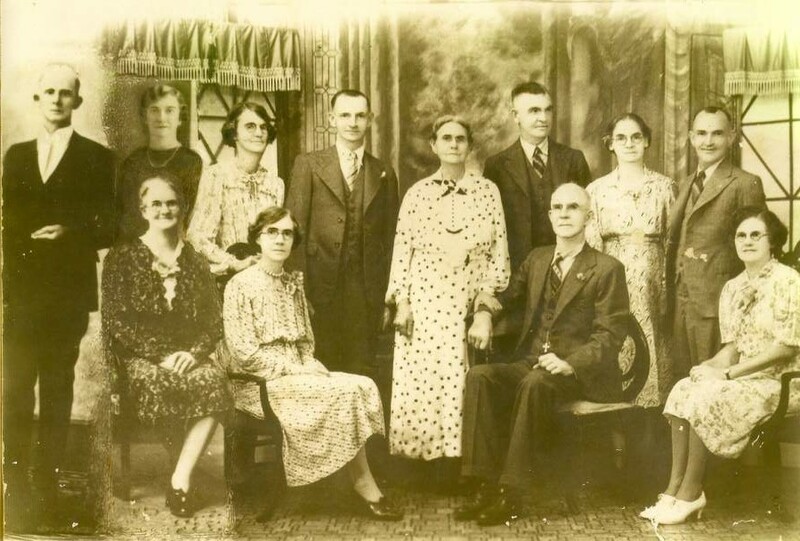 For many of the 120 people who attended, Kunkel had ceased to be their surname long ago, so it was a surprise to learn more about the family and make so many family connections. The din in the room was deafening so it seemed everyone had a good time. 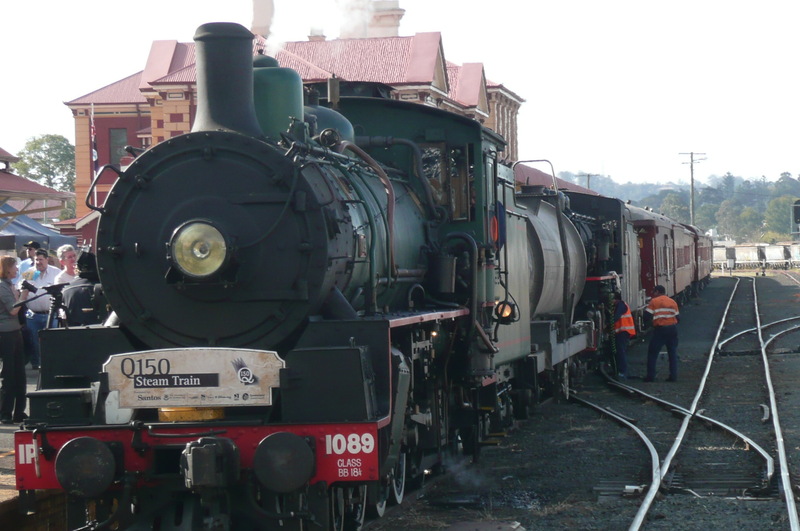 I enjoyed the Q150 steam train to Toowoomba with a friend in 2009. We steamed through Murphys Creek where my ancestors had been when the railway was built. © P Cass 2009. Toowoomba is also close to our hearts because a very good family friend lived there for many years and we visited often, especially while one daughter lived with her for a while during university. And of course there’s all my family history haunts, including the cemetery where I’ve spent many happy hours exploring family graves. 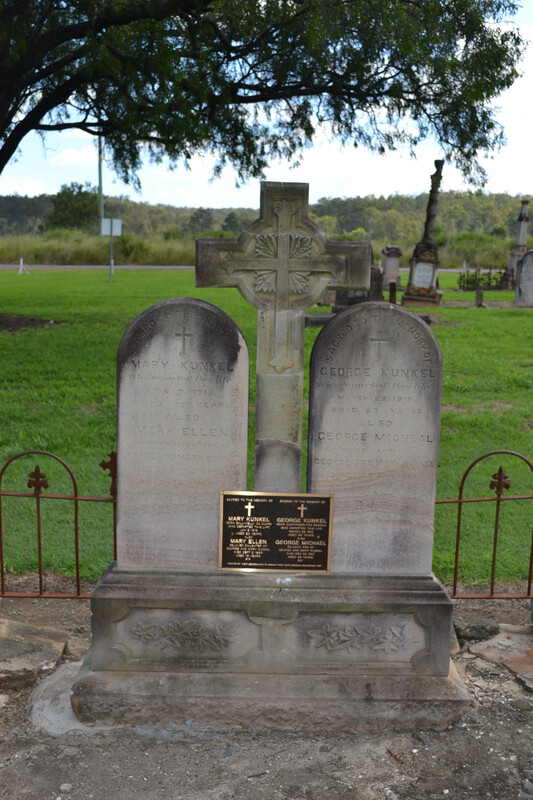 A number of my Dorfprozelten emigrants are also laid to rest here, as quite a few relocated to Toowoomba after their first years in Queensland (then called Moreton Bay). My Furlong ancestors lived in Tullamore from about 1840 though it’s not known when they arrived there, or from whence they came. My 2x great-grandparents, Bridget Furlong and James Sherry (late McSharry) married there and my great-grandfather Peter Sherry (later McSherry) was baptised there. I’ve talked about this family line a few times on my blog, so if you’re interested, just put “Tullamore” in the search box, top right, and the relevant posts will pop up. Inspired by a post by Aillin at Australian Genealogy Journeys I had to give this a go, using Wordle to produce a cloud of my families’ names and places. Haven’t figured out how to deal with double-word places eg Charters Towers but it was fun.